Haiti: Elections Better than Expected? Security and logistics for Haiti’s October 25 elections went much better than expected, but the results – preliminarily announced this week but likely to face challenges – will probably leave many Haitians disappointed. With 54 presidential candidates and 6,000 other candidates for legislative and local positions, party monitors outnumbered voters at some polling stations. The Observatory for Institutionalizing Democracy estimates that turnout was about 30 percent. Despite sporadic demonstrations leading to the arrests of 234 people, the process was fairly peaceful. Allegations of ballot stuffing persist but remain unsubstantiated – perhaps because the fraud has been better organized this time, according to some observers. These elections were in sharp contrast to the long-overdue August 9 elections – the first round for legislative seats – which were disastrous. In August, 13 percent of voting centers were forced to close because of shootings, vandalism, and voter intimidation, while the Haitian National Police stood by. Dozens of police officers failed to report to work or guard candidates (for which they were later suspended). 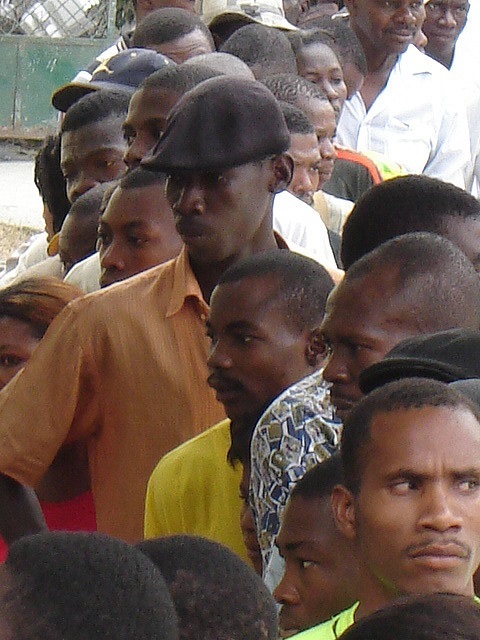 Voter turnout was a dismal 18 percent, as the chaos discouraged Haitians from voting. Twenty-five of 119 first-round deputy races had to be repeated on October 25 because too many votes were thrown out due to violence and fraud. Only eight deputies (out of 119) and only two senators (of 20 open seats) won races outright. Electoral results are released more slowly in Haiti than practically anywhere else in the world because the ballots must be trucked to Port-au-Prince to be counted, and then the Provisional Electoral Council must process requests for re-tallies from 166 political parties. Preliminary results won’t be known for several more days, and final results, which will reveal the names of the two candidates in the December 27 runoff, are expected in late November. But the international community wants to declare the October elections a success, apparently eager to end the country’s stagnation since the parliament was dissolved earlier this year. The newly arrived U.S. Ambassador to Haiti, Peter Mulrean, said in an interview that Haiti “really can’t afford to have that kind of stalemate” and expressed approval for the electoral process within the first few hours of voting. If President Michel Martelly’s chosen successor, banana exporter Jovenel Moïse, wins, widespread protests are possible from Haitians angered by the current administration’s corruption. They will continue to claim U.S. interference. Jude Célestin, former head of the government’s construction ministry who was bumped from the 2010 runoff by an OAS recount, has vowed to ensure he makes it to the final round this time. Mid-October polls showed him with a considerable lead, commanding at least 30% of the vote. Another major contender, former Senator Moïse Jean-Charles, has alleged that ballots with his name on them have been destroyed, and called for “either elections or revolution” at a rally with his supporters. Fanmi Lavalas candidate, Maryse Narcisse, received a boost from former President Aristide in the final days before the vote when he joined her to campaign in downtown Port-au-Prince. Although Narcisse has struggled in the polls, her party was barred from the ballot in the 2010 elections, and so it remains unclear how they will fare this time. Even assuming the transfer of power is peaceful, Martelly’s successor will face a number of critical challenges in addition to Haiti’s perennial ills, including a deportation crisis with the Dominican Republic, a cholera outbreak, languishing earthquake recovery, and a drought which has increased hunger.